There are a lot of different opinions floating around about the best way to land a guy’s or girl’s phone number in a bar. Many times, it depends on the situation, the person, and even how you’re feeling at that particular moment. Read on for an entertaining tale of someone who dared to try the oldest trick in the book. I walked into my favorite sports bar for some wings and a game. After I sat down at my usual table, the menu flopped down in front of me and I heard an angel’s voice say, “What’re we drinking?” I looked up, and there she was. A blonde vision from heaven. I’d been coming to this place for months and there were a few good-looking waitresses working there. 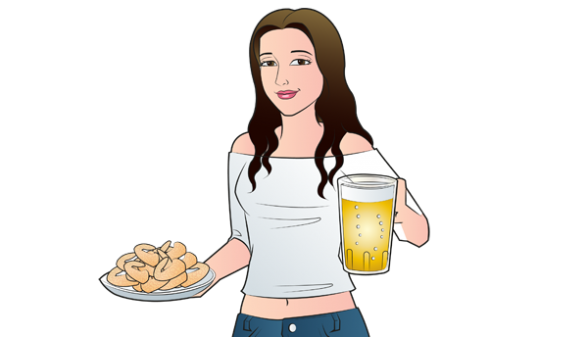 There were always plenty of guys coming in, and after a few beers they would inevitably start hitting on the cute waitresses with reckless abandon, making it just about impossible for anyone to get anywhere with them. These girls were stone-faced beer slingers. I swallowed hard and stuttered a reply. She smiled and brushed a curly lock of gold from her eyes before walking away. I watched as her hips slowly sway as she walked away. She was wearing a pair of khaki shorts that stopped at the top of her thighs and her shirt only covered one shoulder, with the other side hanging down low on her arm. She had a perfect hourglass figure and deep blue eyes with long lashes. Every time she came near my table, I could feel my stomach get tight and my hands start to sweat. After I finished my wings, she came by to see if I needed another beer. I didn’t, but I took the opportunity to get to know her a little better. “So, did you just start working here?” I asked. The perfect woman. I felt my fear slip away as we talked about the jobs she’d had before, and the classes she was taking at a nearby community college. She was friendly, beautiful, and (amazingly) single! She even had a good sense of humor. I’d never met anyone like her, and I was hooked. As I was paying the check, I considered just writing my phone number in big digits on the front of the bill or on a napkin. She couldn’t miss it there, right? I hesitated. How many other guys had I seen try this trick before? It never worked. They never got a call. I decided I was going to take a slightly different approach using a little text flirting. It was risky, but I knew I had to give it a try. When the waitress came back to take the bill, I asked if she had her phone on her. She replied that she did. She gave me a puzzled look, and then handed me her phone. It was a smartphone with a pink cover. I used the touch pad to punch in my phone number and then pressed the green dial icon. I held her phone to my ear and waited while my phone vibrated silently in my pocket. When it went to voicemail, I handed it back to her. After I had paid my bill and left the bar, I opened up my phone and saw the missed call from her phone. I saved it to my contacts under “Angel”. Text Dating Or Text Flirting? After text flirting back and forth with her for a few days, I found out that she was going to be at a local band’s concert the coming Friday. So, I decided to check out the concert as well. On the big night, I sent her a text when I arrived, and she came looking for me right away. She greeted me with a big hug – she told me afterwards that she felt like she already knew me through our text exchange. I was too. We’ve been dating for about six months now. I still venture into my favorite sports bar once in a while to watch games and eat wings, but mostly just to see my favorite girl. The day I met her, I learned that sometimes you need to trust your instincts and go with your gut. The woman of your dreams could be just a few text messages away from being yours; all you need to do is get her number. 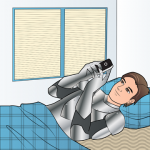 If you want to learn how to send mesmerizing texts that will keep you on their radar long after you’ve left the room, then take a minute to check out TEXT WEAPON – French Seduction Made Easy.  This comprehensive eBook will teach you all the ins and outs of how to really rock a text message and all you need to know about text flirting. If you can score his or her number, then we can help you keep them engaged.